Today, as I was dropping Ja’Ana off at her job, and heading to the store, Rob called. He did not have good news. While Patsy was putting away dishes, they heard this loud noise and discovered that the stove had suddenly blown out the breaker, and there was a strong electrical smell. There had been signs that the old stove was starting to fail, such as 1 burner burning out, and lights that ceased lighting, but….this was death, not just a minor inconvenience. So, Rob made phone calls, and then went and bought a new stove. It’s beautiful:). And that, my friends, is one of the main reasons I try to save money each week….in my life, stuff happens! Frequently! It’s a bit discouraging to have to spend the money I’ve been saving, but it would be even worse to have to go without a stove/oven. I was ok to not have a microwave for a while, but didn’t feel I could wait for this. 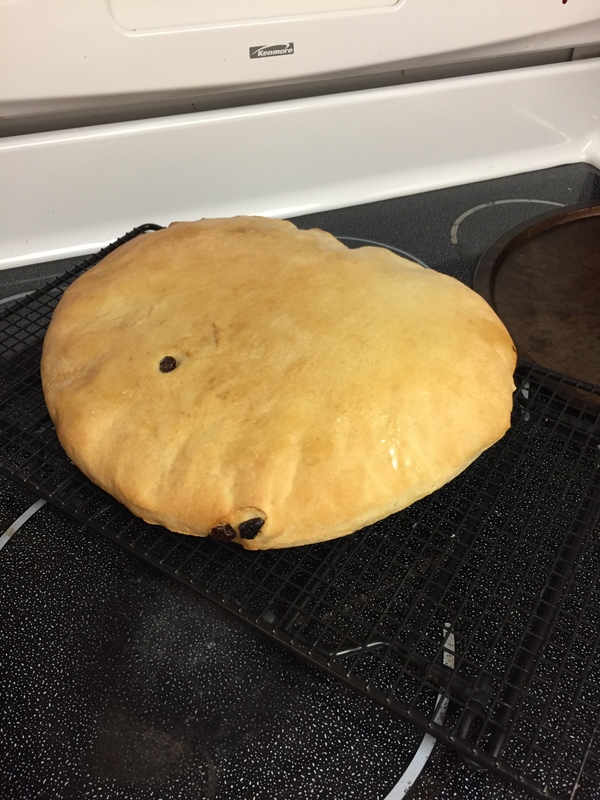 In the meanwhile…..I had my oldest daughter and husband coming for dinner, and I could no longer bake potatoes or cook veggies on the stove. The meat was slated for the BBQ, so that was no problem. 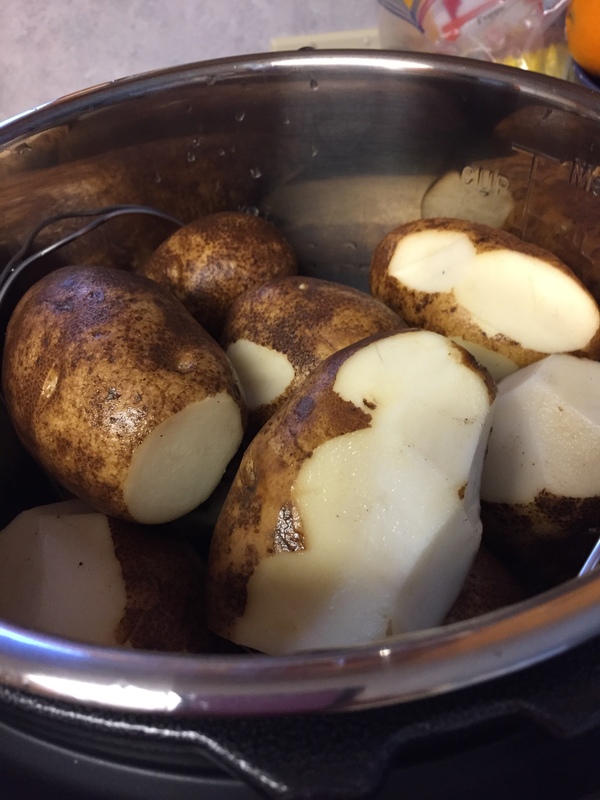 Abbie and I made the potatoes in the Instant Pot, on High for 12 minutes. We then removed them, and made carrots in there, cooking them on high for 4 minutes. By then, the BBQ was going, and the stove was installed by Rob and Keith, so I cooked the beans on the new stove. We had a great time catching up with each other. My aunt made me 2 potholders this week. How did she know such a nice stove would need new potholders?:). I like them so much, I find myself burying them in the drawer so no one will mess them up! It was my week for gifts. 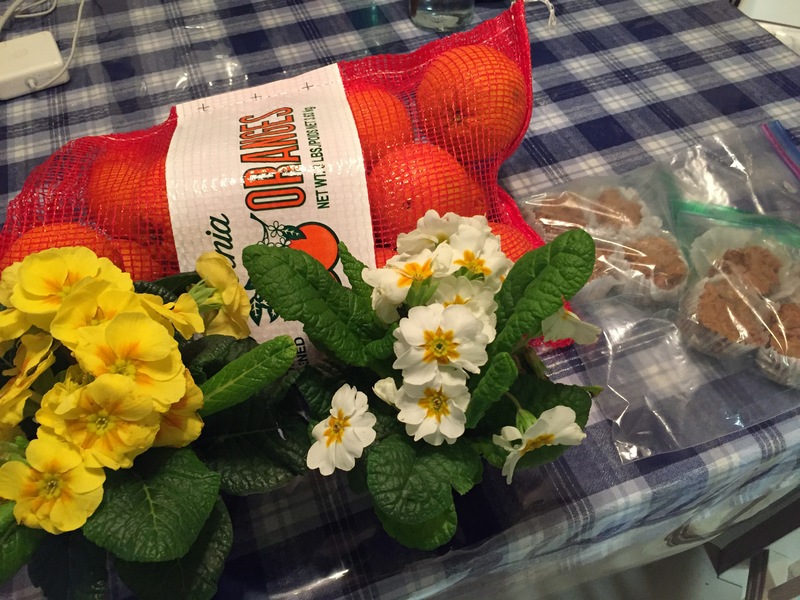 I was given oranges, flowers, muffins and bread. 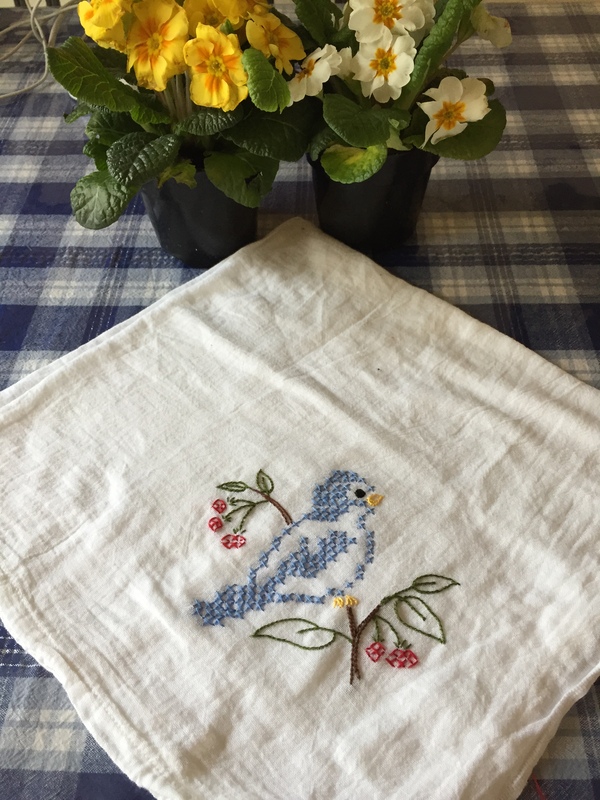 I finished a dish towel. I haven’t been embroidering much, but picked it up again this week. That’s not all that got finished! I’m excited to announce that….. 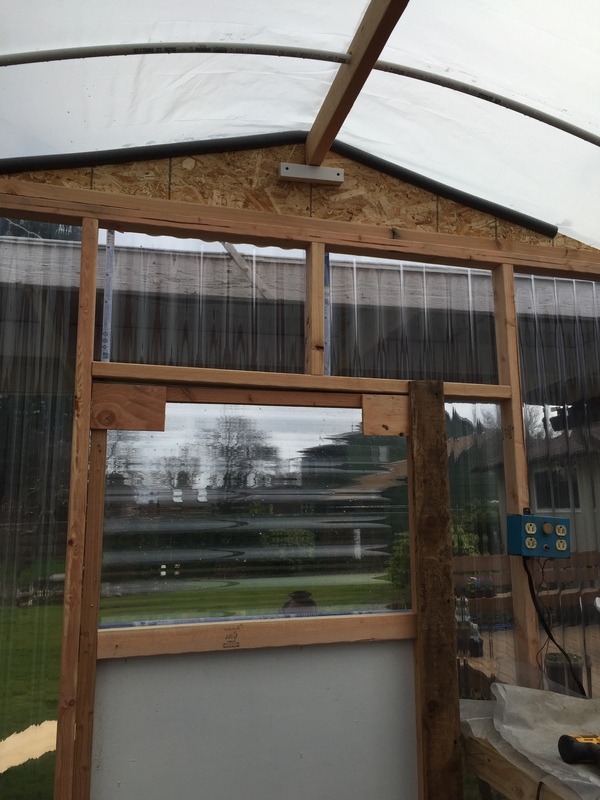 The greenhouse is DONE! Rob finished this morning. The roof is on, the door is done, and it’s already getting warm in there. He build a table for the trays of seedlings, put our heat mat on it, and I got a little planted today. Hopefully, more tomorrow after church! My mom gave Danait some stickers and a little coloring book. She loved them and spent a bunch of time working in there during our visit Friday. There is a little cd of songs that goes with the coloring book. Fun! During the visit, I not only caught up with Harnet, but also with my sister, who shared her recent trip to Europe with us via photos. Double fun!! I love the little embroidery. One of my most favorite gifts are pillow cases my daughter embroidered for me one Christmas. For the longest time I didn’t use them because I wanted them to stay new. Then one day I realized that was crazy. Now I look at them all week and think each night how much I love them. My aunt said I was crazy to save the potholders:). She said if something happened to them, she’d make more! So, I agree–use things!! I love those potholders! I know what you mean about hating to spend the money, but at least it was spent on an item that will see a lot of use! It looks really nice. Thanks! I love them too, so much:). I’m loving the stove, even in only 1 day. I do cook a lot, so I know I will use it a lot! Pretty new stove! I love the embroidery. I had a lady give me a knitted dishcloth and told me I wouldn’t get another one until I used that one up. So, I use it!! Becky – I’ve followed you through Brandy for quite awhile now. The journey you and Rob have had is a testament to how we can go through very difficult circumstances and through great stewardship and love and kindness continue towards a loving and enriched life. The greenhouse is super! Rob and the girls did a great job. I would put a little chair and take my tea and a book out when it is full of growing plants and just enhale that wonderful rich smell. If you were closer (I live in CO) I’d gift you with some of the organic garlic that my cousin-in-law gifted me on Saturday. A third of a brown paper grocery bag wlll go a long way. We’ve been having temperate weather and if I have a few days of fairly warm weather I think I am going to try my hand at dehydrating it. Finally – I taking our food choices slowly towards gluten free. No major health issues but I do think I feel better when eating gluten free. Since I am a MAJOR pasta lover I have tried a lot of gluten free pastas and have to say many of them are ick. The cousin whose husband I mentioned above told me about Trader Joe’s brown rice gluten free pasta. I bought some a few weeks ago when we were close to a TJs and used it this past week. It was very good! It didn’t get gummy, kept its shape in the pasta sauce and had a very pleasant taste. Now I am going to try some of the lentil pasta. 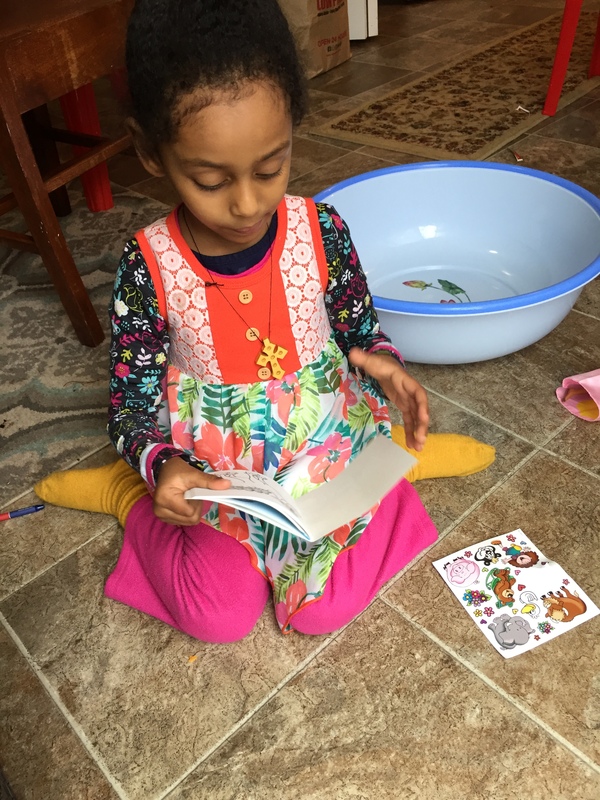 Many thanks for sharing a glimpse into your life and family. Thank you for the kind words and the thoughtfulness about sharing garlic! I did freeze some peeled garlic one time, when a great deal was given to me–that worked to grab in a hurry. I’ve never tried drying it–you’ll have to let everyone know how it turned out. I love the Tinkyada brand of gf pasta. I also enjoy the Jovial Foods brand. I’ve had the Trader Joe’s one, as well, and like it, too. I’m still working on frozen meals with gluten-free pasta–they tend to mush up if I’m not careful. Love your sewing, and love the new stove and greenhouse!. My stove, which was gifted to me six years ago this month, is on its last leg, I think, so I understand how you feel! I’m a little worried that the fridge is next:). I wonder if the gentleman who lived here before us bought them all at once…..He and his family lived here for years and years (like maybe since the 70’s), so it’s possible. 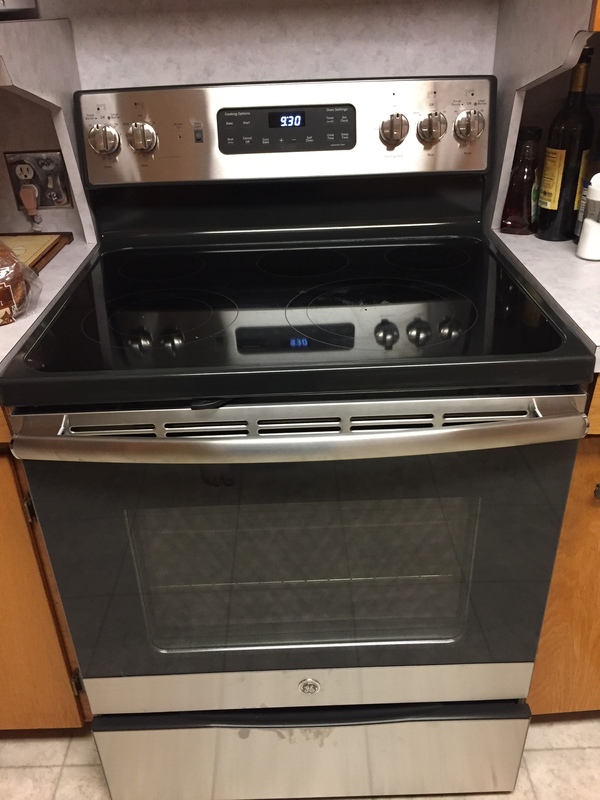 I really want another fridge anyway, but need to build back the fund–it’s been hit hard with both a microwave and oven/stove in the last few weeks. So, fingers crossed…. I love your tea towel and the quilted potholders. 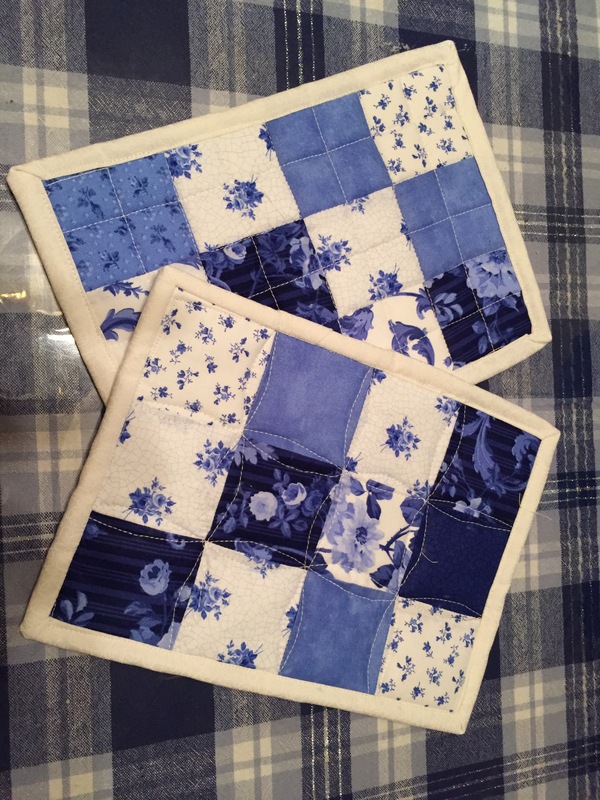 I’ve wanted to try making some quilted potholders, and that just inspires me again. How wonderful you were able to get the stove switched out so quickly. I look forward to hearing about your greenhouse adventures. Thank you. I love the greenhouse so much, already. I have little seeds planted, and even think I saw a little root sprouting on some cabbage already:). Glad to see that the greenhouse is done! Sorry to hear about the stove, but the new stove looks very nice and how wonderful to have the savings in place to buy one! And how nice to have new pot holders to go with it! It is quite possible the appliances were bought all at one time. That’s what I did, when I bought my house. I’m wondering about that, too, and hoping the fridge isn’t next!